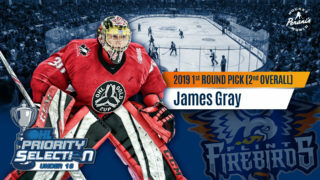 Flint, Mich. – The Firebirds wrapped up their third game in three days Sunday with a close match against Sault Ste. Marie, where the Greyhounds prevailed 5-3. Jake Durham continued his red-hot play, earning his fourth multi-point night in the past five games. He has now tied his career high in points for an OHL season with 30, just 29 games into the campaign. First-year forward Evan Vierling recorded his first three-point game of his young OHL career, assisting on all three Flint goals. Ty Dellandrea found the back of the net for the third consecutive game. 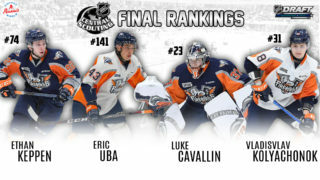 Between the pipes, Emanuel Vella made 40 saves on 44 shots and Hakon Nilsen surpassed Jacob Collins for most career games played in a Firebirds’ uniform with 178. The Greyhounds opened the scoring in the contest just past the midway point of the opening frame. Alex Johnston scored his fourth of the season with a rising wrister off the left post from inside the right-wing circle at 10:12, assisted by Cullen McLean. Flint tied the game at one with under 30 seconds remaining in the first period. Jake Durham redirected a shot from Riley McCourt past Soo netminder Matthew Villalta (Los Angeles Kings) for his team-leading 17th of the season and first of the night. The goal came at 19:38, with the assists to McCourt and Evan Vierling. First period shots were 18-10 in favor of the Greyhounds. The Soo struck early in the second period to reclaim the lead. Brighton, Mich. native Keeghan Howdeshell broke out on a two-on-one with Cole McKay. Howdeshell faked the pass across the high slot before sending a snapper short-side, top-shelf. The goal was his team-leading 21st of the season and seventh tally in his past five games. Jordan Sambrook (Detroit Red Wings) claimed the solo assist on marker scored 33 seconds into the middle frame. Durham struck again, netting the equalizer at 5:47 of the second. Ty Dellandrea (Dallas Stars) recovered a loose puck in the right-wing offensive circle and slid a short pass to Durham between the crease and the right circle. Durham quickly turned and fired, catching Villalta off-guard and scoring his second of the game through the five-hole. Vierling picked up his second assist on the play. Dellandrea gave the ‘Birds their first lead of the contest at exactly the 8:00 mark of the center stanza. First-year forward Evan Vierling carried across the neutral zone in front of the players’ benches before putting on the brakes sending a pass to Durham just inside the right circle. Durham’s shot on Villalta was saved with the right pad, but the rebound found Dellandrea on the doorstep. Flint’s captain toe-dragged the puck and tapped it in for his 13th of the season. The Greyhounds responded with a pair of second-period goals to reclaim the lead before the second intermission. 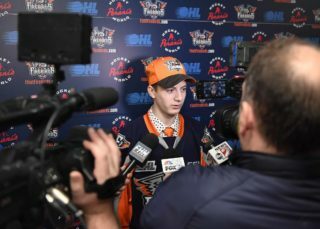 First, Philadelphia Flyer’s prospect Morgan Frost scored the third goal for Sault Ste. Marie at 13:17. Zack Trott was credited with the solo assist. Next, Howdeshell picked up his second goal of the game with 32 seconds to play in the frame, assisted by Frost and Jacob LeGuerrier. Howdeshell’s was scored shorthanded. After 40 minutes of play, the Soo had the 4-3 lead in the game, and the slight edge in shots-on-goal, 30-27. The third period remained scoreless for 19 minutes, with the Firebirds battling for the equalizer. Flint used their one time-out and pulled Vella to the bench, but they were already short-handed and the manpower was evened five skaters per side. Howdeshell completed the hat trick with just six seconds left in regulation on the empty net. Final shots-on-goal were 45-28 in favor of the visitors. Flint successfully killed four of five penalties, with the lone goal surrendered going into an empty net late. Next up, the two teams will meet again this Wednesday night in Sault Ste. Marie. Puck drop is set for 7:07 p.m. (ET) at the GLF Memorial Gardens. Wednesday evening’s contest can be heard live on the radio throughout Flint & Mid-Michigan on US 103.1 FM, online at www.us103.com or by downloading the US 103 app here. Dominic Hennig will call the play-by-play action with pre-game coverage beginning begin 37 minutes prior to puck drop at 6:30 p.m.